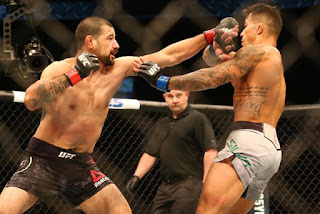 In a sport like MMA where historically the judging has been controversial at times, it's pretty much expected that when a fighter goes to a decision in a close fight there's a possibility that the judges blow the call. You'd hope that trained judges would know what they're watching, but over the course of 25 years of MMA we've seen enough to worry. That's why you often hear the mantra "Don't leave it in the hands of the judges." Still, you expect more often than not that the judges will know what they're watching, and if there's a controversial decision on a card, usually it's only in one fight. But at UFC on FOX 27 there were at least five fights that proved to be controversial as far as the judging went. 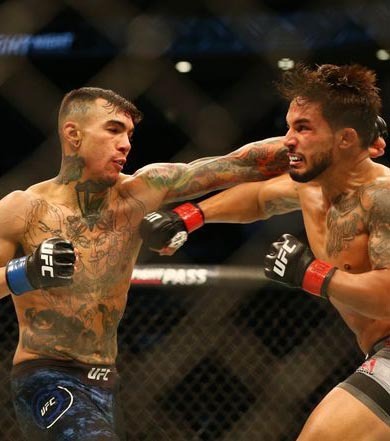 In the co-main event, Andre Fili edged out a split decision win over Dennis Bermudez, 29-28, 29-28, 27-30, in a fight most media analysts and fighters scored for Bermudez. For reference, I scored the fight 29-28 in favor of Bermudez. The fact that two judges saw two rounds for Fili, yet one judge scored all three for Bermudez, shows that something was wrong here, not to mention the fact that the judges that scored it for Fili gave him two different rounds. According to MMADecisions.com, 12 out of 15 media members scored it in favor of Bermudez. The majority of fans who scored the fight also had it for Bermudez, and according to FightMetric.com, Bermudez outstruck Fili 103-80, though Fili had four takedowns to Bermudez' one. It's likely the takedowns swayed the judges, but they shouldn't have, because even without the stats it was pretty clear to most watching that Bermudez won the fight. Now, though, he has another loss on his record and will likely be fighting for his job his next time out. It's not right that trained judges who should know what they are watching scored the fight for the wrong man. Also controversial, though not as much, was the opening main card bout between Frank Camacho and Drew Dober, which Dober won by unanimous decision 30-27, 29-28, 29-28. Again, a close and competitive fight that could have gone either way, but that 30-27 score stands out like a sore thumb. Personally I scored the bout 29-28 in favor of Camacho, though looking back and taking a look at the FightMetric stats, it seems like Dober was a fair call, considering he outlanded Camacho 145-106, while Camacho had three takedowns and three guard passes. According to MMADecisions, the media was split halfway on the fight, but the fans saw it overwhelmingly for Camacho. The judges who scored the fight 29-28 for Dober can't be criticized too much here, but the one who scored it 30-27 for Camacho was straight-up wrong, and it needs to be pointed out how bad of a card that was. A woman's flyweight bout between Katlyn Chookagian and Mara Romero Borella should also be pointed out. Chookagian won the fight by unanimous decision 29-28, 29-28 and 30-27, but according to FightMetric, she only landed 26% of her significant strikes to Borella's 37%, and Borella outlanded Chookagian in total significant strikes 79-68, also scoring the fight's only takedown. While the media had the fight for Chookagian on MMADecisions, most fans had it for Borella. I too had it 29-28 for Borella, as I refused to give Chookagian points for the large amount of air punches she didn't land. It was a close fight to be sure, but in my mind, another bad decision by the judges. But perhaps the most egregious decision the judges made came in the women's flyweight bout between Ji Yeon Kim and Justine Kish, which Kim won via split decision 29-28, 30-27, 28-29. This one was almost downright shocking, as the overwhelming majority of media members and fans scored it for Kish according to MMADecisions and FightMetric had Kish outstriking Kim 96-68 in a fight that stayed on the feet for its entirety. Kish, in fact, outstruck Kim in every round. 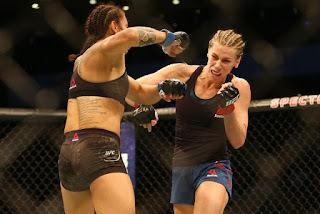 I have no idea how the judges saw this fight for Kim (in my mind it should have been a unanimous 30-27 decision in favor of Kish), and I was shocked Kim got the win, derailing Kish's UFC career in the process. Comparatively, the fight between Vinc Pichel and Joaquim Silva was only somewhat controversial, as Pichel took home a unanimous decision (29-28, 29-28, 29-28). According to FightMetric, he outlanded Silva 60-45, but media members were split on the fight, and most fans had it in favor of Silva, according to MMADecisions. This one was more of a toss up fight than a true controversy, but it's still worth mentioning. Again, we know going into these events that the judges might blow a call here or there, but at UFC on FOX 27, it's fair to say they blew up to five calls. That's a bad ratio, and it shows that the judges in North Carolina need to re-learn the rules of the sport. It's not fair to these fighters that they have to go through long and gruelling training camps and put their careers on the line, only for the judges to mess everything up. Yes, if the fighters finished the fights the judges would not be involved, but it's not realistic to expect fighters to finish every fight. And there's bound to be some difference in opinion in a sport as subjective as MMA, but it was egregious at UFC on FOX 27 and these judges need to be held accountable for blowing numerous calls. Let's hope the next time the UFC visits Charlotte this doesn't happen, because if it does, the UFC may have no choice but to stop going there until something changes. And the fact that the UFC's cost-conscious new owners don't seem to be as generous as the Fertitta brothers with win bonuses for fighters the promotion feels were robbed doesn't help either. We need better judging in this sport, and UFC on FOX 27 showed once again the harm that can happen when the judges don't know what they're doing.